In 1996, the British band The Beautiful South released the song ‘Rotterdam (or anywhere)’. At the time, I was only 9, but remember the song clearly. It lingered in the charts for months and haunted my brain for even longer. For twenty years, this vaguely depressing song was my only point of reference for Rotterdam: Holland’s second largest city and Europe’s busiest port. When Lonely Planet therefore voted Rotterdam one of the top ten cities to visit in 2016, I was a little surprised. Perhaps it was Beautiful South’s confusing claim that ‘the whole place is pickled, the people are pickles for sure’, but I was pretty unsure what to expect from this seafaring city. 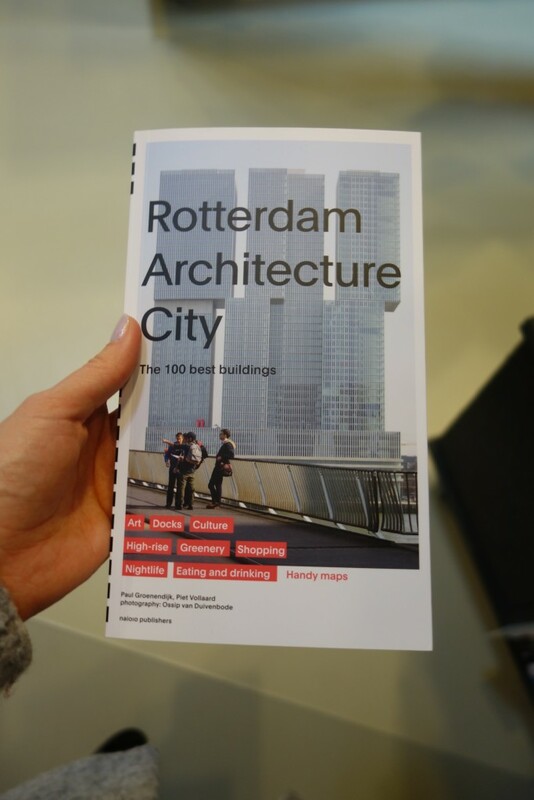 Nonetheless, when Rotterdam Partners invited us to visit the city on a windswept weekend in March, we were curious to see what all the fuss was about. With Beautiful South’s song on loop in our brains (I bet you’re humming it to yourself now, sorry), we set off on the 35 minute flight from London to Holland’s lesser-known city, Rotterdam, determined to move on from 1996. After breezing through the airport (after a four hour wait in the world’s smallest airport in London), we made our way into the city centre. As we drove in, the skyline began to fill with bold colours and irregular shapes. Large, yellow cube houses loomed heavily over the road, like dice rolling across the skyline. An enormous, inverted-U-shaped building dominated the horizon, filled inside with a paintbox of colours. A towering bridge crossed a large river, mimicking the shape of a giant swan. In the background was a large skyscraper, made of a mismatch of cubes and boxes, whilst on the other side of the river sat a glittering white art-deco building. It was a cityscape we had not expected. 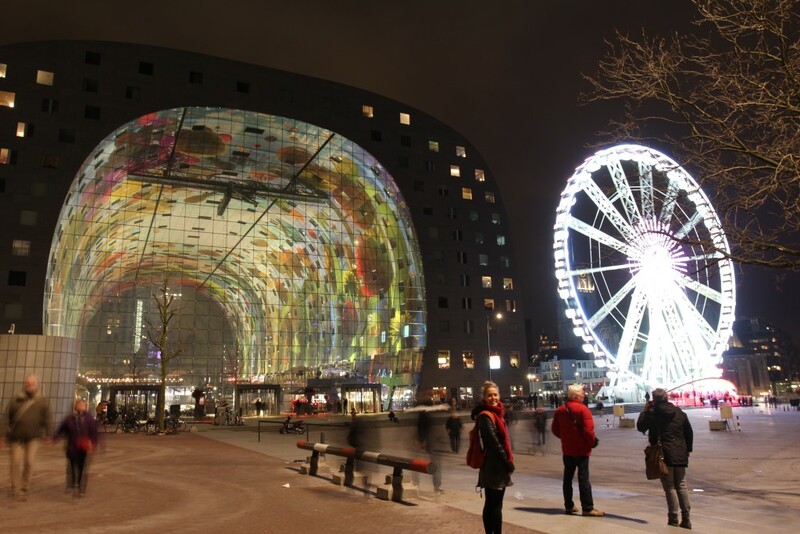 Once you learn of Rotterdam’s history, this ambitious architecture makes a little more sense. In the height of World War II, Rotterdam became a key target for the German Luftwaffe. A large port, providing much of the allies with goods and weapons, it was decided that on May 14th 1940, Rotterdam must be bombed. Heavily. In the space of a few hours, over 97,000 tonnes of explosives were dropped on the city, destroying it entirely. Aside from 3 original buildings, nothing remained of this previously medieval city. However, within three days, Rotterdam was back on its feet. 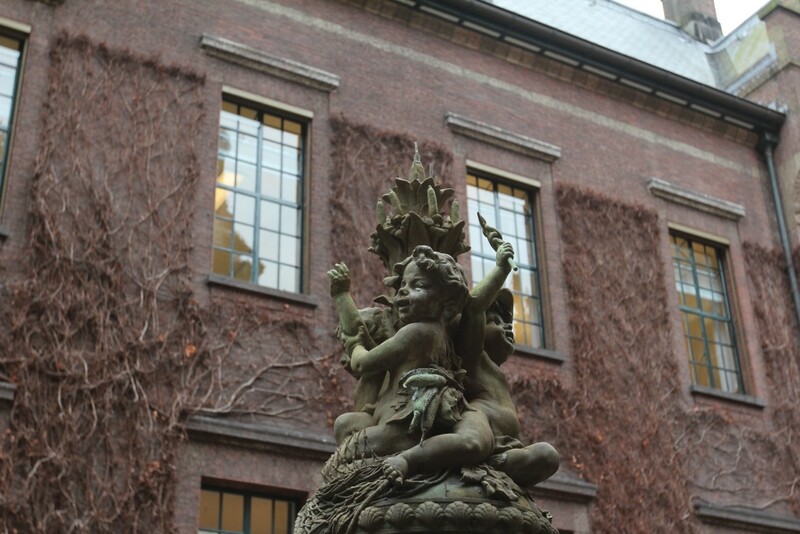 Rather than mourn the loss of its old buildings, it decided to wipe the slate clean and start afresh. With an entirely blank canvas, it had the rare opportunity to create something new, modern and relevant: a city like no other. 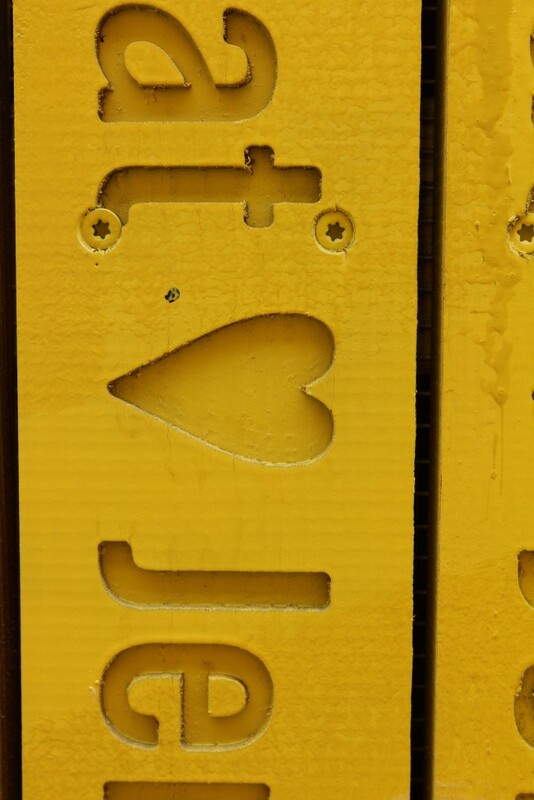 And, from our three short days in Rotterdam, I’d say it succeeded in doing just this. From our first day walking around this giant outdoor gallery of a city, it’s clear that this isn’t a place that takes itself too seriously. It’s architecture is bold, silly and colourful. The people are relaxed, friendly and fun (whilst we were there, there was a giant dominos game, stretching 3km through the city!) It’s a city that had a near death-experience and bounced back, complete with a new ‘carpe diem’ attitude. One willing to get tattoos, dye its hair pink, let loose and live a little. 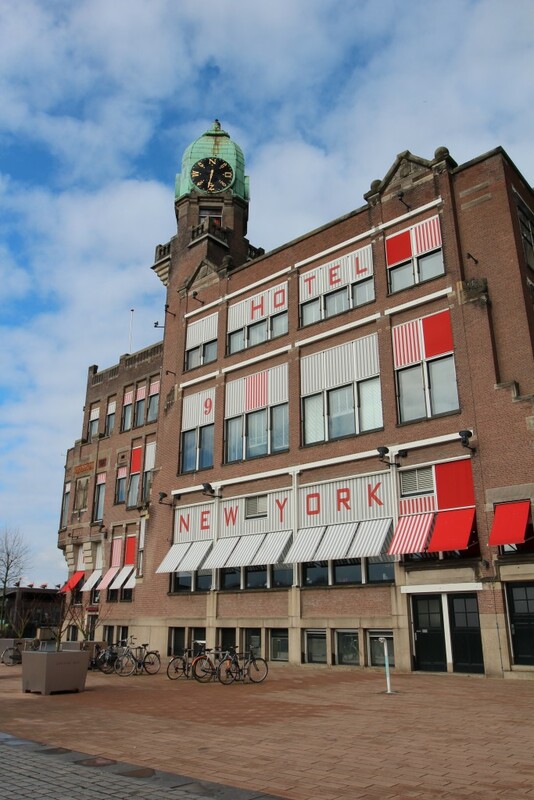 As Rotterdam is so much of an architectural wonderland, most of this blog post will cover the must-see buildings and sights that give this incredible city so much of its eccentric character. 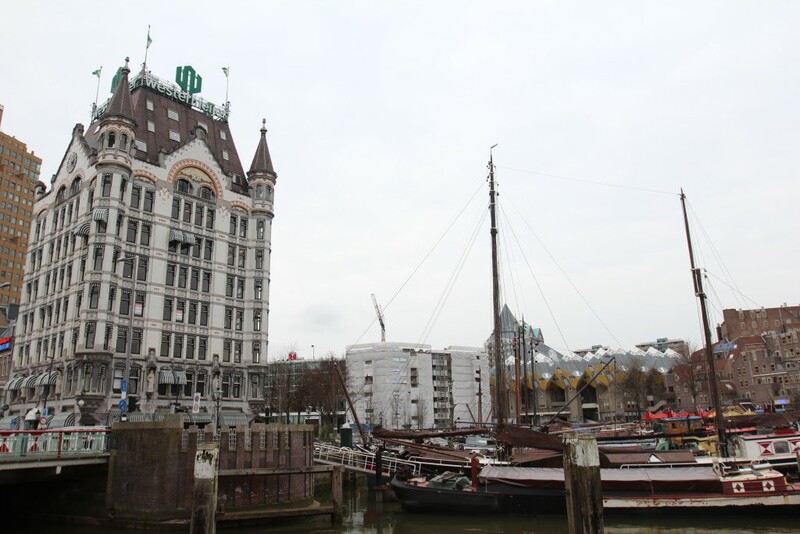 Any historic tour of Rotterdam is brief, given the fact much of it was left a cloud or rubble in 1940. Nonetheless, pockets of it remain. 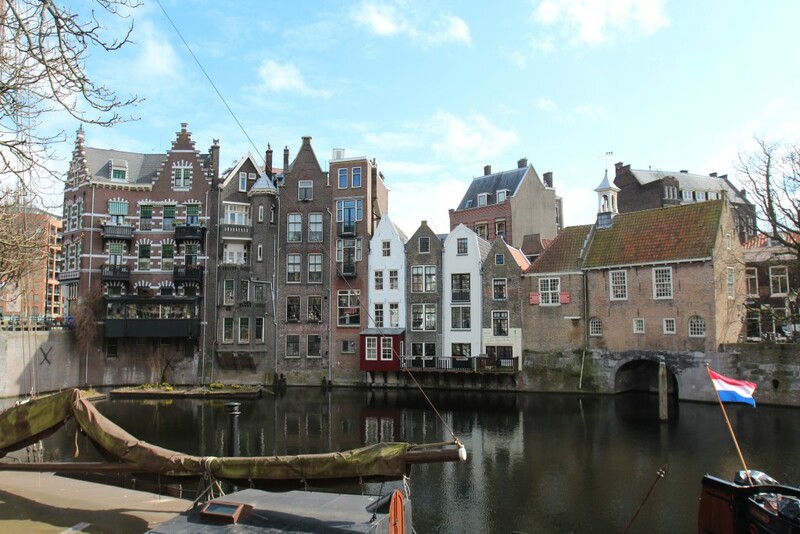 Definitely worth visiting is Delfshaven, a small slither of historic Rotterdam that escaped the bombings. After getting a water taxi there (we literally flew across the river in one of these!) we crossed a large highway, before suddenly rounding the corner to find a large windmill and pretty harbour, lined with traditional Dutch houses. It felt like a little film set. Quiet and peaceful, we walked up here in the sunshine, admiring all the houseboats and the famous Pilgrim Fathers Church – home to the Pilgrim Fathers, before they left for America in 1620. Although small, there are plenty of cafes here to have a coffee, whilst enjoying a quiet moment in historic Rotterdam. In a different part of the city sits the Witte Huis: Europe’s first ‘skyscraper’. Built in 1897-1898 and only 11 stories high, it’s hard to believe this ever counted as a large building; yet it long remained one of Europe’s tallest buildings for many years. Sitting proudly in the old harbour, this is a gorgeous art noveau building that contrasts sharply with the post-modernist cube houses, that sit just behind it. Another surviving building we managed to see was the City Hall. Again, this building sits quietly amongst a sea of modern and cutting-edge architecture, and although made up predominantly of offices, is definitely worth a quick sneak into. Even before its bombings, Rotterdam was beginning to experiment with its architecture and design. In 1930s, work began on Huis Sonneveld: a forward-thinking home based on a new style of integrated living. Today, the house has been meticulously restored and is open to the public; allowing visitors to be transported back to the eerily immaculate world of 1930s functionalism. 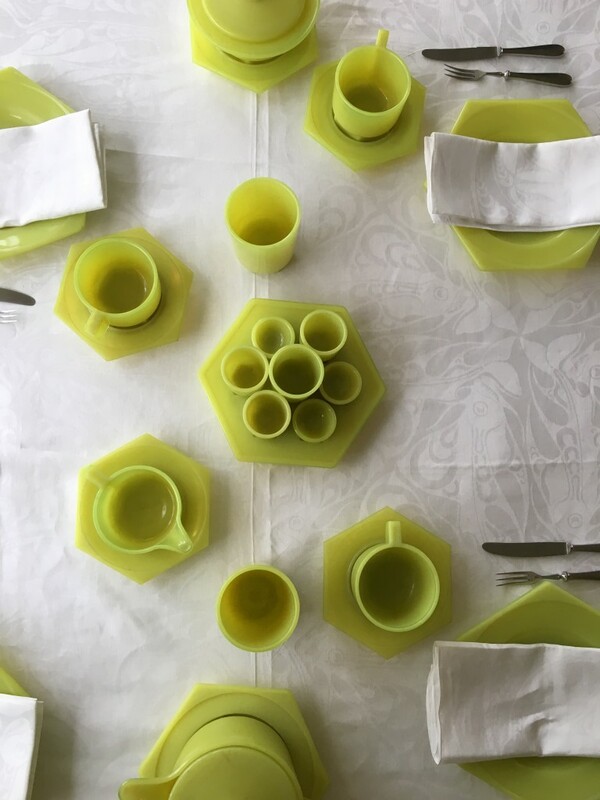 We absolutely loved visiting this home-come-museum, with its lime green dinner set and tiled bedrooms. Built to be functional rather than cosy, the house features garish turquoise bathrooms, enormous living areas and a ‘spiritual’ terrace on the rooftop, allowing visitors to develop their spirituality. Handy. 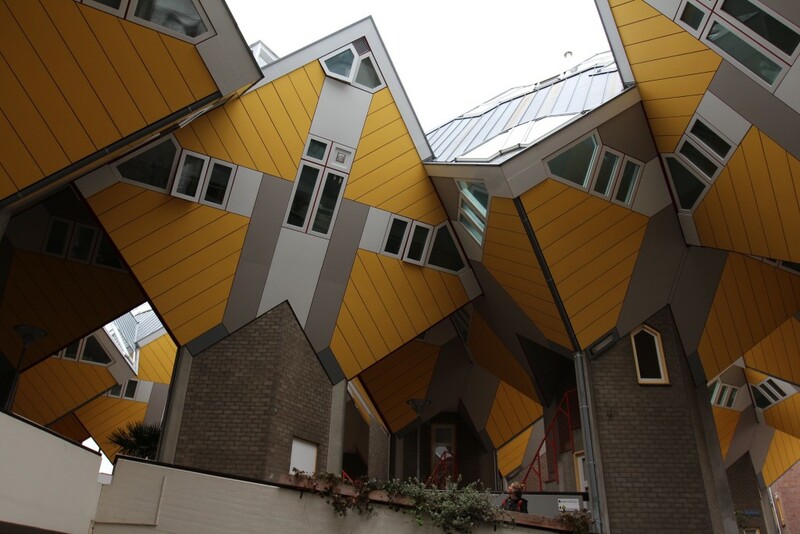 No trip to Rotterdam is complete without a visit to its most eye-popping architecture: the notorious ‘cube houses’. Close to the city centre, these bright yellow, vertigo-inducing homes are difficult to miss. Sitting at an unnerving 45 degree angle and balanced on a pedestrian bridge, the houses were designed by Piet Blom in 1970s. After being pestered by so many tourists, residents opened up one of the houses into a museum; allowing you to experience life firsthand inside the cubes. After climbing up winding staircases and glancing down at the busy road immediately beneath, Claire and I both felt a bit dizzy and wonky. It’s crazy to think people live in these houses full-time! Leading and controversial architecture remains one of Rotterdam’s passions, and new and exciting buildings are continuing to spring up throughout the city. 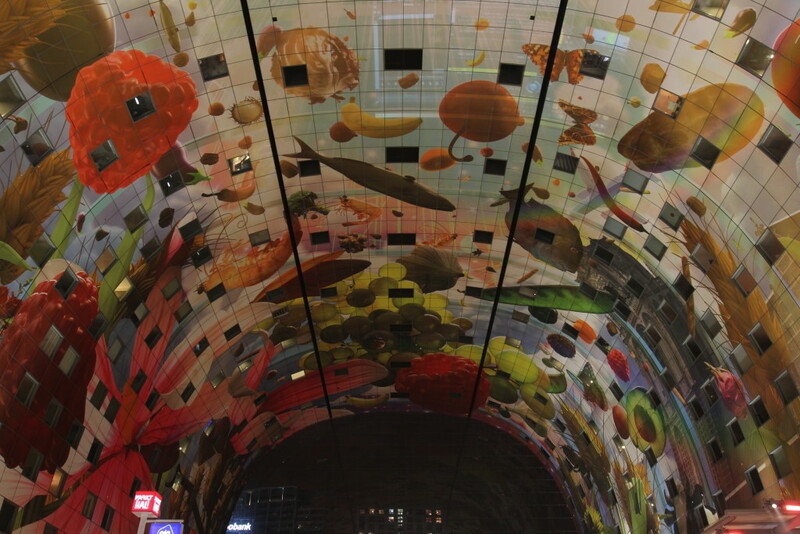 One of these is Markthal Rotterdam (or, the better sounding name of ‘koopboog’!) A regular market hall this is not. Enormous and shaped like a horseshoe, it is filled with incredible food stalls and houses over 228 apartments. But most impressive of all is perhaps its 40m high muriel, filled with giant broccolis, raspberries, grapes and butterflies. It is incredible. Definitely ensure you visit at night, when the bright colours of the muriel shine even brighter; ‘popping’ against the night sky. It is a breathtaking piece of architecture. Several other pieces of recent, futuristic architecture are also worth a visit. 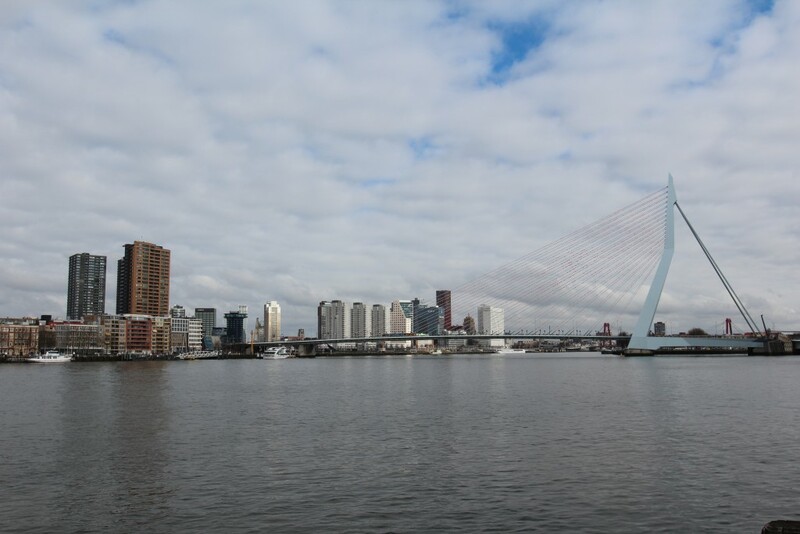 Rotterdam’s ‘vertical city’ – De Rotterdam – is the Netherland’s largest building and designed by award-winning architect, Rem Koolhaas. Made up of various cube and boxes, this influential building looks like a giant game of tetris! Close by is also a dizzyingly tall bridge, nick-named ‘De Zwaan’, which crosses Rotterdam’s vast Nieuwe Mass river and looks incredible at night, stretching across the dark water. Obviously a bridge-loving city, Rotterdam also boasts the vibrant Luchtsingel (‘air canal’) footbridge, which connects the city centre with Station Hofplein. 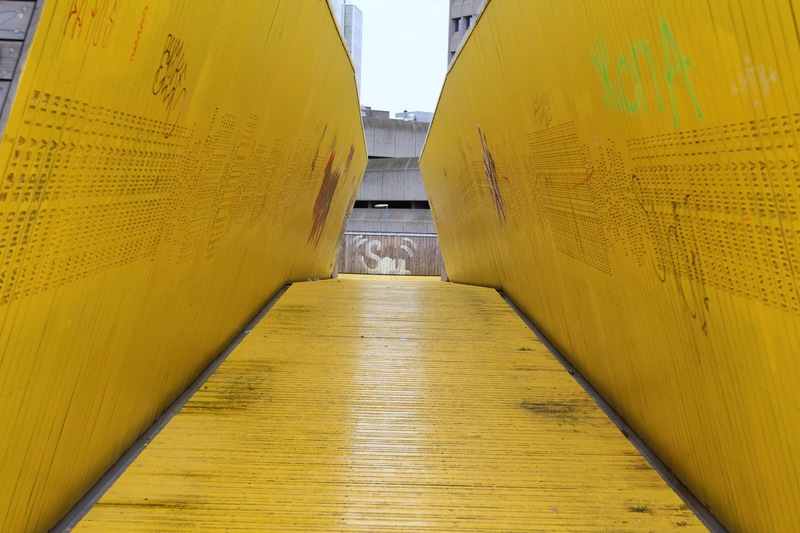 This bright yellow, wooden bridge, is made up of planks bought by Rotterdam’s citizens and businesses; each of which is individually inscribed. On an otherwise grey and windy day, this bridge was a little like a big bright rainbow, crossing the city. Architecture and design is Rotterdam’s lifeblood: the foundation that underpins its uniquely eclectic character. The result is a fun, colourful and surprising city; offering up amazing sights at the turn of every corner. We absolutely loved it. This ‘out-of-box’ thinking and passion for reinvention, however, has not only influenced the buildings throughout the city, but life in general. This is a city that features a floating farm, complete with cows and a dairy (really!) It is a city in which office buildings feature rooftop farms, with harvestable crops and produce. It is a city in which ‘canal surfing’ exists; where individuals can enjoy a 14-second ride on a 1.5m high wave in the central canal. It’s a city where giant dominos festivals happen (pretty much the most fun we’ve had in a long time on a Sunday afternoon!) In short, it’s one of the coolest cities we’ve visited. On the way home, I listened again to The Beautiful South’s now notorious Rotterdam-themed song. It still didn’t make much sense. However, the lyrics ‘this could be Rotterdam, or anywhere’ definitely didn’t ring true. Rotterdam is unlike any city I’ve ever been and definitely not similar to anywhere else. Not at all. Sorry, The Beautiful South. It seems I still don’t like your song. Thank you to Rotterdam Partners for inviting us to spend time in Rotterdam. We had an incredible time! I think Rotterdam has the most interesting pieces of architecture in the Netherlands, it’s becoming such a great city!